Arlin M. Adams was a judge on the U.S. Court of Appeals for the Third Circuit from 1969 to 1987. He was also a Pa. campaign manager for Richard M. Nixon. 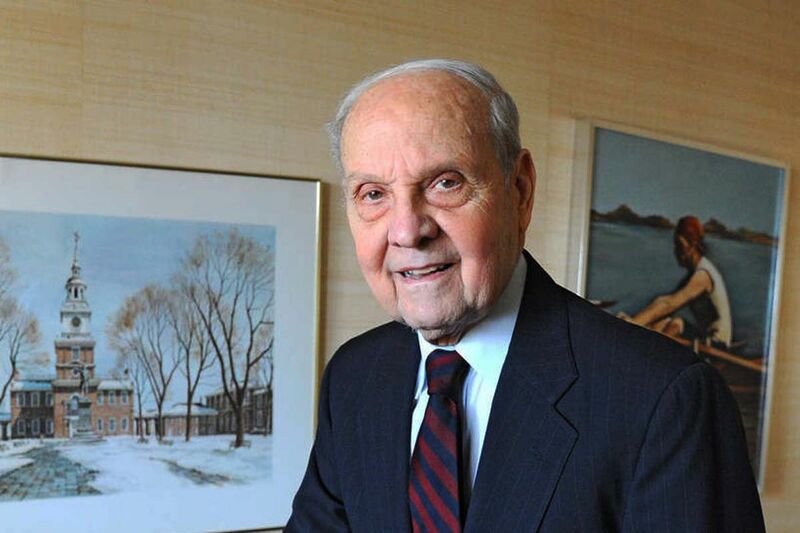 Arlin M. Adams, 94, of Elkins Park, a former judge on the U.S. Court of Appeals for the Third Circuit and a leading figure in the Philadelphia legal community for much of his life, died at his home early Tuesday. During many decades as a respected federal appellate judge, litigator, and, at times, political operative, Judge Adams was frequently in close contact with state and national leaders. Three presidents considered nominating him for a seat on the U.S. Supreme Court. For a time in the late 1960s, Judge Adams was a political ally of President Richard M. Nixon, who put him on a short list for the Supreme Court, a seat that eventually went to now-retired Chief Justice William H. Rehnquist. He also was close to former Pennsylvania Gov. William W. Scranton and to Walter H. Annenberg, a friend and political supporter of President Ronald Reagan. "He was a treasure, he really was," said Gaetan Alfano, the incoming chancellor of the Philadelphia Bar Association. "Anyone who has read his opinions knows that he is intellectually honest. The scholarship that went into his opinions was extraordinary, and nothing about his work was results-oriented." As a lawyer and a judge throughout much of the 20th century, Judge Adams had a front-row seat to much of modern American history. In the 1980s, Judge Adams helped run an investigation of the U.S. Department of Housing and Urban Development under Reagan that resulted in 17 convictions, more than $2 million in fines, and a finding that the department was riddled with corruption. "I've had all the advantages," he said when he retired from the Center City law firm of Schnader Harrison Segal & Lewis in 2012. Judge Adams' colleagues described him as unusually selfless, putting the interests of others at the firm before his own. "He was the least egocentric person you have ever met; he was gracious to everyone," said Ralph Wellington, a litigator at Schnader Harrison and former chairman of the firm. He also was a man of simple tastes. "This simplicity is the very essence of who Judge Adams is," said Schnader appellate lawyer Nancy Winkelman in remarks at an unveiling of Judge Adams' portrait at the firm. "When you travel with him for cases, as I have had the opportunity to do, he stays in the most modest of hotels, and prefers to dine on a bowl of soup in his hotel room, while opposing counsel are enjoying a five-star meal at the fanciest hotel in town." Judge Adams served on the Third Circuit court from 1969 to 1987. He came of age during the Depression and at age 16 worked a $5-a-week job to help support his family. He earned his undergraduate degree from Temple University and his law degree from the University of Pennsylvania, where he served as editor-in-chief of the law review. He joined Schnader Harrison in 1947, then became close with Scranton and served for a time as Scranton's secretary of public welfare before joining the court. His career benefited from his reputation for legal discernment, but also from the assistance of powerful politicians who came to rely on him for advice. Nixon asked him to manage his 1967 presidential campaign in Pennsylvania after the two were introduced at a luncheon in Delaware. He agreed, partly at the urging of law firm founder William Schnader, and after Nixon took office Judge Adams was nominated to a seat on the Third Circuit bench. During his time on the appellate court, Judge Adams came close on three occasions to being nominated to the Supreme Court. Rehnquist got the nod on the first occasion, after word leaked out that Nixon was thinking of nominating Judge Adams. The Republican Party's conservative wing, which was just gaining force, mobilized against Judge Adams, whose affiliation with the relatively liberal Scranton had worked against him. He also was one of two finalists for a seat on the court during the Ford administration. Scranton had pushed for his nomination. But John Paul Stevens, with strong backing in the Senate, was nominated. On the third occasion, Annenberg, a former publisher of The Inquirer, wrote to Reagan asking that he name Judge Adams, but the seat went to Anthony M. Kennedy. In a 2012 interview, a retired Judge Adams spoke critically of the political and ideological battles that enveloped the selection of judges on the state and national levels. And he said law firms had focused too much attention on earning fees and not enough on the ideals of the profession. But he said he had faith in the judgment of average Americans. "The normal state of the majority of citizens, especially in a place as blessed as this country, is to do the right thing," he said. Judge Adams is survived by his wife of 73 years, Neysa; daughters Carol Kirshner, Judith, and Jane; four grandchildren; and one great-grandchild. A memorial service will be at 2 p.m. Friday, Jan. 15, at Reform Congregation Keneseth Israel, 8339 Old York Rd., Elkins Park. Burial will be private.